Why are analytics and metrics important? If you’re running any kind of store then you need to know how well your store is doing. You need to know how much of a profit (or loss) you’re making, and you need to know the causes of your profit (or loss). The great news is that, if your store is online, you can get all this useful data relatively easily. Thanks to Web analytics tools such as Google Analytics, you can measure how well your store is doing and track down specific problems on your store (such as a under-performing product pages). Setting up Google Analytics is pretty straightforward. Go to the Google Analytics homepage and click the Sign Up Now link. You’ll need to use your Google Account to sign up (if you don’t have one then you can create one at the same time). Once you’ve signed up, you need to tell Google Analytics about your website. To do this, click the Add Website Profile link on the Analytics Settings page and follow the on-screen instructions. The easiest way to include the tracking code on every page of your site is to put the code in an include file. To do this, your website needs to be able to use server-side includes, or to be written using PHP, ASP, or similar. If in doubt, ask your Web developer for help with this. Alternatively, if you’re using eCommerce software on your site then you may be able to edit the global page template, or add a variable, to insert the tracking code. The code will then appear on every page of your store. Ask your software provider for more information. Some hosted software providers, such as Yahoo! Merchant Solutions, also give you their own analytics service that you can use to track your store metrics. 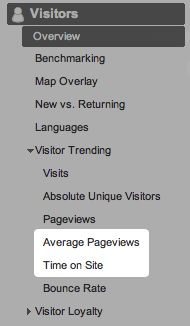 On the Analytics Settings page, click the Edit link next to your website. On the Profile Settings page that appears, click the Edit link to the right of the “Main Website Profile Information” heading. Click the Yes, an E-Commerce Site option, then click Save Changes. Conversion rate is arguably the most important metric to measure on your store, because it is a direct indicator of how good your store is at selling your products. Your store’s conversion rate is the ratio of visitors to sales. For example, if your store gets 1,000 visitors in a day and makes 20 sales, the conversion rate for that day is 20 ÷ 1,000 x 100% = 2%. Typical conversion rates can vary wildly depending on market segment, but most conversion rates fall somewhere between 0.5% and 5%. Obviously, if you have a high conversion rate then your store is doing a good job of turning visitors into customers. However, if your conversion rate is low then you’ll need to look at why visitors aren’t buying your products or services. Even if your conversion rate is relatively high, there’s always something you can tweak on your store that may improve things further. Make a change, then monitor the conversion rate for the next month or so to see if it’s gone up or down. As well as viewing your overall conversion rate (as shown above), you can view individual conversion rates segmented by traffic source, search keyword, landing page, and so on. For example, click the Traffic Sources menu option followed by the Referring Sites option, then click the Ecommerce tab in the report and view the “Ecommerce Conversion Rate” column. If you have a low conversion rate then these reports can help you pinpoint the problem — for example, it may be that your main traffic source is sending you low-quality visits. Stuck for ways to improve your store’s conversion rate? Here are 25 things you can try. Useful though conversion rate is, it can take a long time to gather meaningful conversion data, particularly if you don’t have many sales per month. Furthermore, although low conversion rates indicate a problem with your site, it can be hard to locate the exact cause. For these reasons, it can help to look at other metrics such as bounce rate. Bounce rate tells you how many visitors leave your site immediately after visiting just one page. If your store’s bounce rate is high then it’s likely that your store is doing a poor job of engaging visitors and turning them into shoppers. If you can reduce your bounce rate then you’ll probably end up increasing your conversion rate as a result. As with bounce rate, these 2 metrics can give you further insight into visitor behaviour on your store. If visitors are only visiting 1 or 2 pages on average, or are spending a very short amount of time on your store, then there may be a problem with your store. Look at these 2 metrics closely when you make any major changes to your store, such as changing page layout or site navigation. Do you see a sharp increase, or a sharp decrease? This can tell you whether your changes are positively or negatively impacting your store’s performance. From this example, you can see that most shoppers (50%) are abandoning the buying process when they’re asked to complete the checkout form. This would indicate that there are some aspects of the form that are putting people off. The buying process is often visualised as a funnel. It’s wide at the top (lots of shoppers) and gets narrower as the shoppers “move through the funnel” to the final sale. 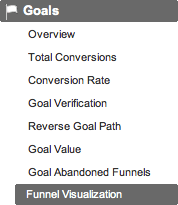 On the Profile Settings page that appears, click the top Add goal link in the “Goals” section. Click Yes, create a funnel for this goal. For each step in the funnel process, add the step’s URL (e.g. /checkout.php) and give the step a name (e.g. “Checkout”). Click Add Goal Funnel Step to add additional steps. You’ll see a diagram showing each of the stages of your funnel. Each stage shows the number of people who entered that stage. Below each stage, a figure shows how many people proceeded from that stage to the next stage (as a number, and as a percentage). By looking at this diagram, you can see where most people are dropping out of your funnel, which should give you a good idea as to what parts of the funnel process you should improve. If the checkout is your store’s weak spot, read 10 Ways to Improve Your Store Checkout. If you use Google AdWords to drive traffic to your store then it’s a great idea to link your Google Analytics account to your AdWords account. This lets you measure how successful your AdWords campaigns are at generating sales on your site. How many visits the campaign sent to your store. The total cost of the campaign. Cost per click: How much each ad click cost you, on average. Revenue per click: How much each ad click earned you, on average. This is calculated by looking at which clicks resulted in eCommerce transactions and/or goals that have a value assigned to them in Google Analytics. Return on investment: This is calculated as (total revenue from campaign – total cost of campaign) ÷ total cost of campaign. If this figure is positive then you’re making a profit from your AdWords campaign; otherwise you’re making a loss. Your profit margin on the AdWords campaign: This is calculated as (total revenue from campaign – total cost of campaign) ÷ total revenue from campaign. 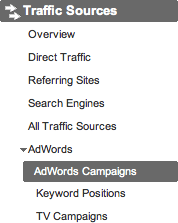 Again, you want this figure to be positive, since this shows that your AdWords campaign is profitable. If you discover from this report that your AdWords campaign has a negative ROI — that is, you’re spending more money on ads than you’re making from them — then you’ll need to look at optimising your ads, keywords, and landing pages. The average amount of money that customers spend per order. This can be useful when you’re cross-promoting products or running time-based promotions — if the average order value increases then your promotion is probably a success. How many times a customer visits your store, on average, before they buy something. This can help you design your store’s structure and content. For example, if customers tend to buy your products on the first visit then your products may be suited to impulse buying — therefore you can design your content to encourage more impulse purchases. How many days, on average, between a customer first visiting your store and buying something. As with the Visits to Purchase report, this information can be useful when it comes to designing and tweaking your store content. This brings up your site in a new window. For each page of your site, it shows you the percentage of visitors that clicked on each link in the page. It also shows you transactions, revenue and other useful stats for each link. This can be useful for tracking visitor behaviour on your key landing pages, and finding out exactly what actions visitors are taking (or not taking). Some important metrics for determining your store’s effectiveness, including conversion rate, bounce rate, pages per visit, time on site, goal funnels, AdWords Campaigns, and more. You’re now ready to start measuring your metrics and make your store a success. Good luck!